There are going to be a lot of times that you study in the college common room or a coffee shop. You may find that the time you want to study is the time that your dorm roommate wants to watch TV, and you need to work on your homework without distractions. The problem is you will find there are a lot of dorm necessities you need to take with you. You need your tablet or ereader, your notebook, and a bunch of pens, highlighters, and sticky notes. With all these college supplies that you need to bring with you, it can be easy to drop it all in the hall or on the ground on your way to your destination. 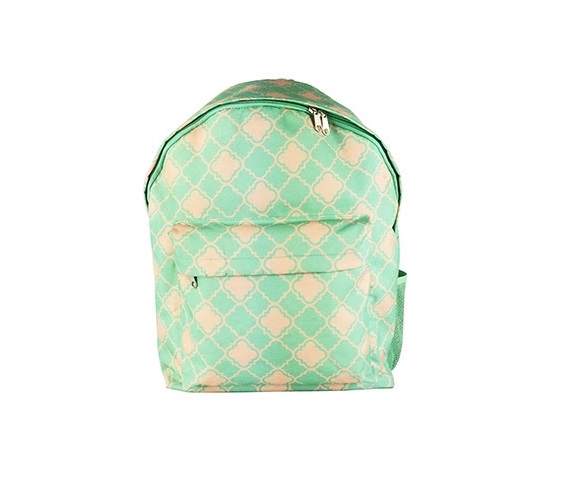 Avoid dropping your study accessories with dorm necessities like our Quatrefoil Turquoise College Backpack. This dorm necessities item has a cute, trendy style that will make you feel fashionable while doing something not so fun like studying. Featuring a cool looking turquoise and cream pattern and with a dorm accessories pouch in the front, this is a must have dorm item for studying. The front pouch will keep your small dorm items such as your writing utensils in one spot so you don't have to dig around between your notebook and tablet for your highlighter!